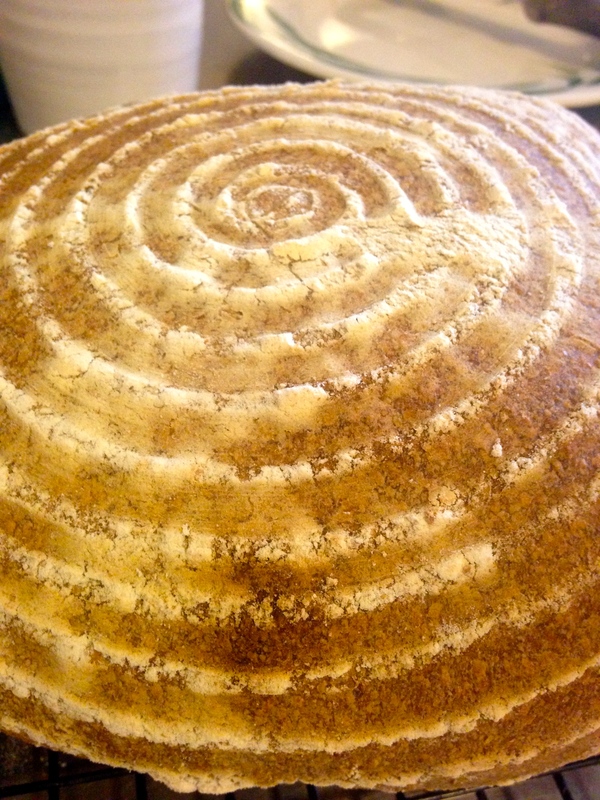 Everyone wants to bake San Francisco sourdough - they want the challenge, they want the flavour, they want the texture and most of all, they want the HOLES! 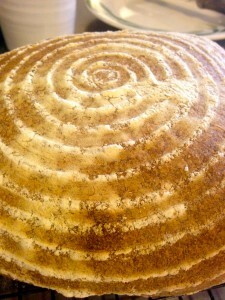 There are hundreds of recipes for San Francisco Sourdough bread. Some call for 100% wheat and some call for a wheat/rye dough. The "sour to flour" ratio can vary from as low as 35% to as high as 65%. Some ferment over 3 days and some over 12 hours. Some have a very high hydration and some do not. Some require stretching and folding every hour and some do not. If you are in San Francisco, you should certainly go to Boudin's. They have great SF sourdough but I cannot tell you how they bake it, nor can I provide you with the "most authentic" recipe for you to try at home. 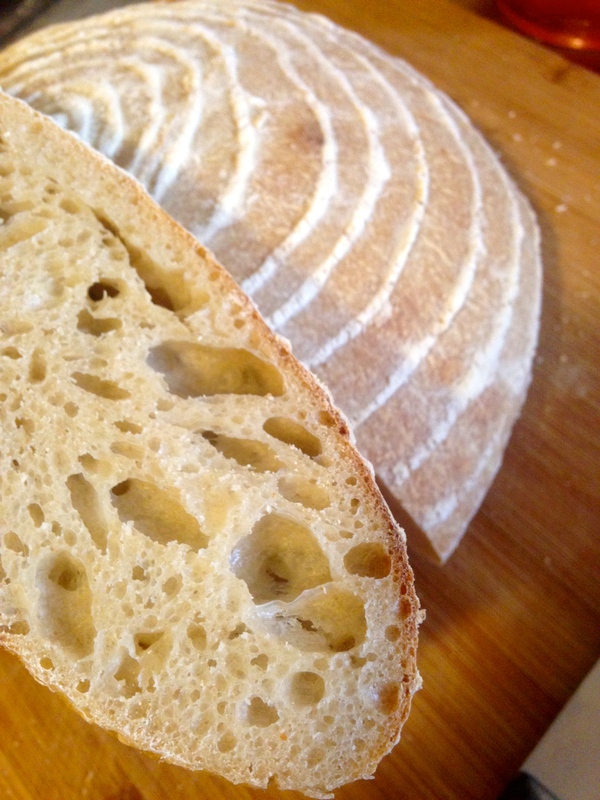 However, last week I developed a recipe for San Francisco Sourdough Bread that is as easy as it gets, with a nice open crumb (read: holes) and a great flavour. Measure the sourdough starter into a large bowl and return any remaining starter to the refrigerator. Add 80 g of the flour and 80 g of the water. Stir and cover with plastic wrap, and leave on the counter for around 8 hours. Make sure your starter is ready to use. Add the remaining ingredients and knead well for 10 minutes. Cover the bowl with a shower hat and leave on the counter for 6 hours. Stretch and fold the dough every hour during that time (this is important to do if you want holes). To do that simply pinch the edge of the dough, stretch it up and fold it over the rest of the dough. Don’t press it down, just lay it down. Work your way around the edge of the dough, stretching and folding 4-6 times. That’s it. Then, cover the dough and let it sit for another hour. After 6 hours, turn the dough out on to a floury surface. Stretch and fold the dough one last time and then shape it into a tight ball. Flour the top generously and place it floury top side DOWN in a well floured, 1 kg, round rising basket. Cover it with the shower hat again and let it rest 2-4 hours until it passes the probe test. Line a baking tray with parchment and gently turn the dough out of the basket. Pop it in the oven and bake for 10 minutes and then lower the temperature to 200 degrees celsius and bake for a further 30 minutes. Remove the dough from the oven and let it cool completely on a wire rack. Come and take a bread baking course with us - we will love to help you learn more about the pleasure of baking your own delicious bread. What if I do not have a sourdough starter and I just want an easy recipe for holey bread? Can I use this recipe and leave out the starter? Hi there, no you cannot sadly, because taste and texture both vary with ingredients and method. However, give this a go: http://www.virtuousbread.com/bread-and-conversation/simple-recipe-for-no-knead-artisinal-crusty-bread/ and you will have some holey bread that you will, I hope, like. Hi, can I make the same recipe using spelt flour? And you don't have to make a slit in the dough and bake it covered? Hi, you can use spelt flour for certain and no of course you dont have to slit it or bake it covered if you don't want to! What temperature do you have the dough at on the counter, between folds and while rising? Hi Wendy - I tend to work at "room temperature" which is about 70 degrees F. Some people work from cold, overnight proof. The time the dough will take to rise does depend on the temperature of the dough and of the air. The colder the combination of the two, the longer the rise.